In this episode, Growershouse owner, Nate, takes viewers on a journey to Denver, Colorado and the House of Dankness. Some of the best strains come from House of Dankness – and no camera crew has ever crossed the threshold into House of Dankness before. Scott of House of Dankness and Rare Dankness talks to Nate about his upbringing in Alabama and chasing his dreams in New York. He quickly realized that growing marijuana was a much safer bet in Colorado, so he and his family moved. He bred seeds and soon discovered that the “rare dankness” captured by his strains were one-of-a-kind. He entered and won the Cannabis Cup Sativa (something no American seed had ever won) with his Rare Dankness strain, the name of which came from the comment of a friend. 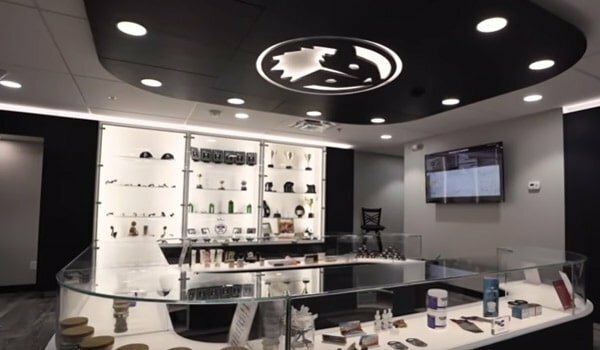 From there, Scott built the facility House of Dankness and Pamela built its accompanying dispensary, a high-end dispensary that some would call the Apple Store of weed. As usual, Nate and Scott head into the cultivation facility, fully clad in their white suits. The House of Dankness does nutrient and other kinds of testing, but their main function is making seeds – and it’s something House of Dankness excels in. They keep this room separate from the rest of the facility to keep it clean and keep the pollen from getting to the flowers. In it they’ve got the Fantech Hepa Filtration Unit from the ceiling, keeping the air clean and fresh. Here is where Nate points out that anyone spending time in a grow room should keep their eyes and skin protected! RayWear is a reliable company that protects from UV, visible, and infrared light radiation. Scott and Nate clad in their Raywear for their skin and Summer Blue Optics for their eyes, head into the mother room. Every single strain comes from the original creator of Rare Dankness: Scott. He tinkers with seeds and genetics and cross-breeds different genetics. Ghost Train Haze is Rare Dankness’ top-selling strain, created with the genetics found in this room. One cool fact about Ghost Train Haze is its high CBD content — it has 6% CBD when most strains like it have less than 1%! Adem Peacock, the Veg Quadrant Lead, manages this well-organized facility. He takes care of the moms, the veg room, and the clones. 700-1000 cuts rest in their perfect environment. Nutrients-wise, Peacock uses an in-house nutrient solution, but he also Super Thrive. Then he uses Emerald Harvest pH Down and pH Up to get the pH levels to around 5.5. The room is equipped with Grow Crew T5 Lights. Grodan Rockwool Cubes and Mondi Trays are used as well. They use a “hardening off” technique to get their young cuttings used to the humidity by slowly opening up the plastic lids to their next environment over the course of 10-14 days. The room is kept at 75 degrees F and 65 relative humidity. Mike Wolf, Director of Operations, provides a glimpse into how they prevent powdery mildew and bugs from occurring anywhere in the facilities. Separate showers, security fobs, scrubbing requirements, shower requirements, and other cleanliness requirements help keep things safe and clean. House of Dankness uses Long Security and Priva to keep an eye on things. 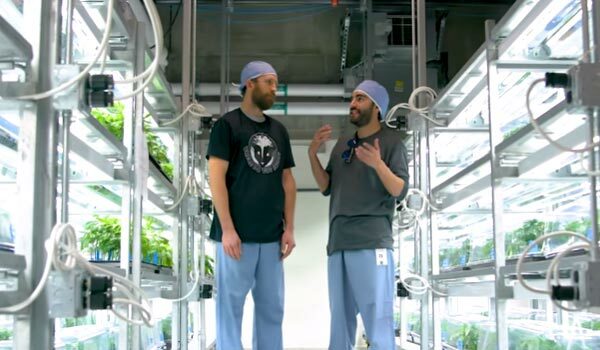 Mike takes Nate into the veg room, another amazingly clean room, where he describes the 30-day veg process at House of Dankness. The room uses Hydrofarm Phantom 630 and Dual 315 Lights which are clearly doing their job. The plants get 3-4 feedings per day, using FloraFlex Caps. The flowering room reunites the viewers with Scott, who shows off tons of cool products – all controlled by Priva. This amazing system considers all aspects of environment control, meaning fewer employees (and the ability to pay and train workers better). The lights are Phantom Lights Double Ends, which they switched to because of better reliability, customer service, and performance in general. Humidity is kept at a solid level with Quest Dual 225 Overhead Dehumidifiers. Scott’s Puridigm Air Filter keeps the air free of any mold spores or microbes (one of the reasons there is no powdery mildew to be found here). There’s also a block of “insurance” rockwool to give the plants a better chance of surviving any mistakes (Green Diamond Stonewool). Speaking of mistakes, Scott also uses the insurance group, Emergent Insurance to keep everything running smoothly if an accident were to occur. He switched to them after other companies tried to take advantage of their status as a Cannabis business. Mike and Nate are extremely excited about how clean the trimming room is. One reason is because the trimming crew comes in when needed and doesn’t go into the rest of the facility, preventing outside contamination. TrimCrews and Harvest More Trim Bins (for hand trimming) help provide a more comfortable trimming experience, as well as better cleanliness. The plants are cut down in the flowering room and then rolled into the drying room, where they sit for 7-10 days. The team gradually bring the humidity to 50% and the temperature to about 70 degrees F. The drying room has VRE Racks, which are ideal for hanging the plant material at the end. They also use Quest dehumidifiers. Curing bins are burped once a day, and the buds are checked daily (or twice per day) as well. This is done for around two weeks until they’re vacuum sealed. Kelsey Roger shows Nate the big, blue Franklin Miller Taskmaster TM8500 Industrial Shredder. There needs to be a 50/50 waste-to-trash ratio to ensure that anyone getting into their trash will end up with unusable materials. Basically, it mixes rockwool blocks and other trash with discarded cannabis, grinding it down into useless junk. Packaging at the House of Dankness is supervised by Alan. The canned cannabis is packaged with nitrogen, and it’s kept fresh for quite some time (at least a year) after it’s packaged, without losing its quality. Alan and his packaging partner use Elements Rolling Papers for their joints – one of their favorites. Jeremy Wilburn, Extraction Lead, shows Nate what goes on in the extraction lab of House of Dankness. The Incredible Extractor does all the extractions, which can be used for all the other product (including vape juice and shatter). The Robot Coupe R30 chops up the flower first (which is frozen first by the Revco Ultima II Freezer to -60 or -70 degrees Celsius). The e-Bottles Glass Pucks, though not made specifically for cannabis,are used mostly for batters and sugars and turn out some delicious edibles. Last but not least: The Dispensary! Melissa Stewart, the manager, shows Nate how things run and what awards they’ve gotten since 2009 (hint: it’s a great spread of trophies). The backend system is Flowhub, which has top customer service and helps things run smoothly. After much hard-investigatory work, Nate selects a pack of Ghost Train Haze #1, 2014 High Times’ strongest strain of the year and Melissa’s personal recommendation.